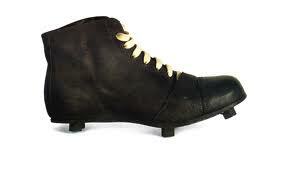 TOTAL FLANKER...a rugby blog: Whatever happened to: Rugby Boots? Back in the mists of time life was very simple for rugby players, especially when it came to choice of footwear. If you were a forward you bought a pair of solid, ankle-high boots with a hard toe-cap. If you were a girl back you wore lower-cut footie-style boots. And, whatever your positional disposition, your boots were unashamedly black. These days, of course, all has changed. White boots, red boots, silver boots, luminous yellow boots…the choice is endless. Even the All Blacks are at it (although I suppose they can be excused on the basis that if you are going to wear coloured boots then you’d better be bloody good). It is, perhaps, a sign of the times – i.e. a need to draw attention to oneself as part of the cult of the individual rather than as part of the collective (a symptom often associated with Haskell’s Disease). If so it is somewhat ironic as, such is the plethora of coloured boots on display these days that, as a strategy, it is doomed to failure. Labels: boots, rugby, Whatever happened to? We used to dreeeam of `avin boots! now the kids dreamif having orange boots like Vincent Clerc. The important thing is to dream of something ! Rugby boots are made using both synthetic and original leather and the best quality boots are usually made out of kangaroo leather. But owing to the growing concern to protect wildlife, the demand for non-animal products is higher. Leather moulds itself to the shape of the player’s feet, while boots made of synthetic materials are lighter and less expensive. Sometimes players choose rugby boots made of leather and synthetics that make them breathable and lightweight at the same time. Thanks. I remember playing with a Kiwi whose boots had metal frame with studs riveted to the boot. It was the most extraordinary pair of boots I had ever seen. And today they would be totally illegal.